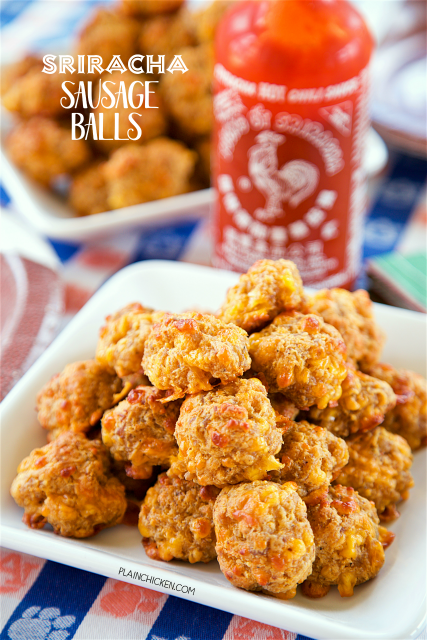 Sriracha Sausage Balls - THE BEST! Great for parties! You can mix together and freezer for later. Sausage, bisquick, cream cheese, cheddar cheese and sriracha. We always have some in the freezer! SO good! I don't know about you, but I love all things Sriracha. I couldn't resist adding Sriracha to my favorite sausage ball recipe. OMG! SO good!!! I have a batch in my freezer right now! 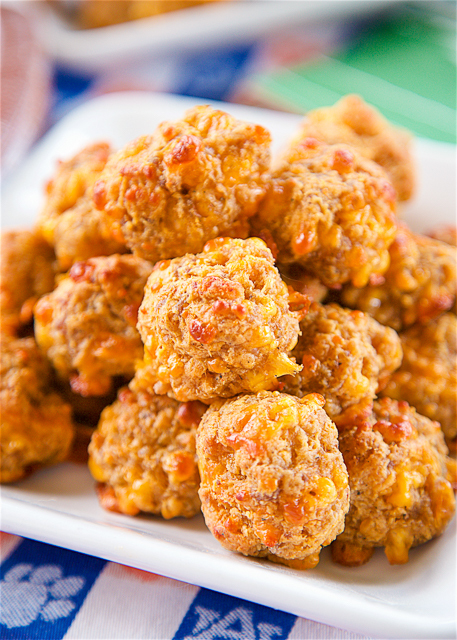 These are great for holiday parties and tailgates. My best tip for making sausage balls is to throw everything in your stand mixer and let it do all the work. I use the dough hook and the sausage ball mixture comes together in no time! PLUS you don't get gross sausage hands! The dough is a little sticky. I urge you to resist adding more Bisquik to the dough. They turn out great just as the recipe is written. I promise. This recipe makes about 5 dozen balls. Now, that number totally depends on how big or small you make your balls. I make my balls about 1-inch round. You can mix these up and shape into balls ahead of time. You can refrigerate them overnight or freeze them unbaked. I freeze them all the time and just add a few minutes to the cooking time when I bake them. Mix all ingredients until well combined. (I use my KitchenAid mixer with the dough hook attachment) Roll into 1-inch balls. Bake for approximately 20 minutes, or until brown. I like your heat addition to the sausage balls and could go for a small plate full right now. What kind of sausage do you use???? I used Tennessee Pride breakfast sausage- Enjoy! YES to this!!!!!! What a great idea! These were a HUGE hit at my office tailgate party this year and now I'm taking them to Alabama's first home game tomorrow for tailgating! Thanks for sharing! Roll Tide!